Other Names: Alicante Blanca, Belan, Feher Grenache, Garnacha Blanca, Garnatxa Blanca, Rool Grenache, Silla Blanc, Sillina lanc and White Grenache. 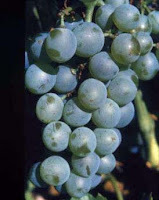 Grenache blanc is thought to have originated as a mutation of the red version of Grenache in Spain. It then spread across the Pyrenees to France, finding a second home in the Rhône. Grenache blanc is mostly found in Rhône wine blends and in northeast Spain. Its wines are characterized by high alcohol and low acidity, with citrus and or herbaceous notes. As the name suggests, Grenache Blanc is related to the more widely known Grenache Noir. like Grenache Noir, is drought-resistant, vigorous, easy to graft and ripens fairly early in the cycle. Because it is a vine with very high vigor it can often produce flabby and low quality wines but if controlled properly it can contribute flavor and length to blends, particularly with Roussanne. Grenache blanc is an important variety in the Rhône Valley of France, often blended with Roussanne in wines and even being included in some red wines. It is a major component in the white wines of the Châteauneuf-du-Pape and Côtes du Rhône. n white Châteauneuf-du-Pape, Grenache blanc provides fruitiness and fatness to a blend that often includes Roussanne, Picpoul, Bourboulenc and Clairette. In Spain it is mostly found in the Spanish wine regions along the Pyrenees, particularly in Navarra and the Terra Alta region in Catalonia. It is also widely planted in the Priorat, Alella and Aragon. It is permitted in the white wines of Rioja but is not widely used due to the tendency of the must to oxidize easily. Thanks for sharing your good knowledge with us hope you get good feed back for your post. Great stuff here. I want to read more of your work.